Our team at Yahoo was asked to create an interactive television app of Flickr for the AT&T U-verse TV service. Since users would be using a tv remote control to navigate the app, it was necessary for the design to accommodate this particular input device. In addition, the set top boxes have a small amount of memory this required pre-loading of images, caching, and perceptual techniques to accommodate the longer load times of large photos from Flickr. This project was initiated by AT&T to enhance the U-verse TV service. 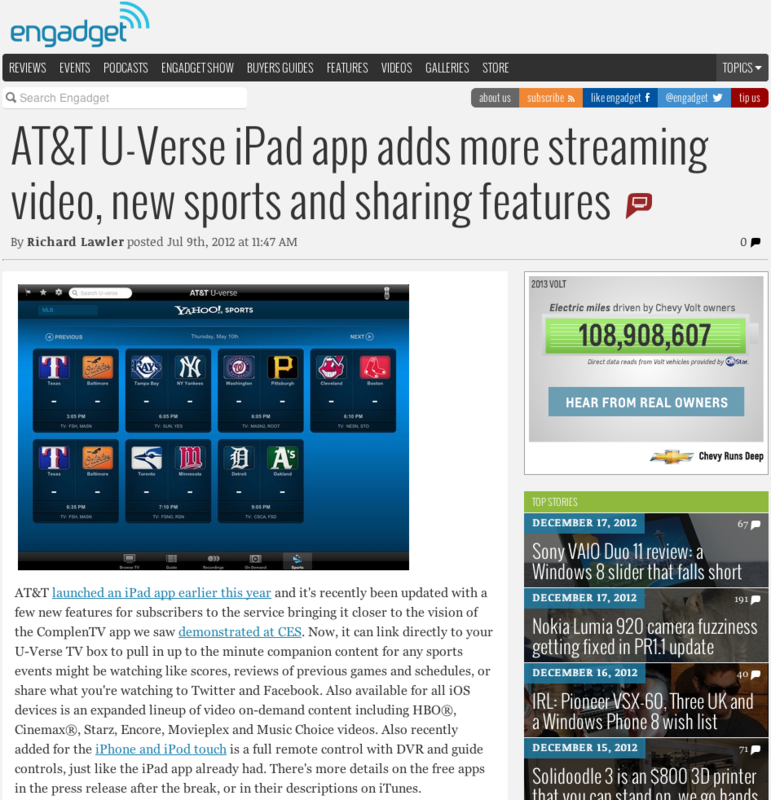 The goal included integrating Yahoo Sports content into the U-verse Tablet app for iOS (iPad), Android, Windows 8. The tablets were able to send record and tune commands to the set top box, therefore the Yahoo component would need to be able to tune or record a game. The main reason for integration was to provide additional deep sports content to the second screen while fans watched their favorite teams. Kaneva.com is the social media, rewards, and game management component of a downloadable 3D virtual world / video game. A clickable prototype was built using a software called Axure. The prototype of Kaneva’s website facilitated stakeholder and developer requirements walkthroughs. Note: many of the prototype buttons are clickable, linking pages together, so that user flows can be explored. After successfully completing a website redesign for a very large bank, they asked us to build a website and client extranet for their investment group. The site included a secure extranet for clients to communicate to their money managers, the public portion of the website was a standard informational sites with a conservative look and feel, typical of a financial institution. This was a fairly straight forward information architecture effort that was done early in my career. I was responsible for creating the first information architecture wireframe “blueprints” at CNN.com in 1995/1996. This blueprint example was used to develop a mini-site for the Hong Kong Handover news event. I enjoyed working at CNN.com and feel that many of the workflow processes and techniques are just as valid today. There are a few stories about CNN on my site as well.